This is the first thing I check if a network printer is unavailable for a Windows computer. 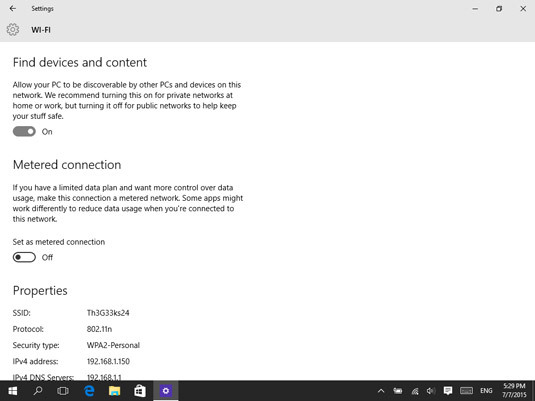 Set Network settings to allow your PC to find devices. Select the Start button, then select Settings . The list of network and Internet related settings appears. Click Wi-Fi or Ethernet, depending on the type of network you’re connected to. If you’re connected to a wireless network, click Advanced Options under the list of available wireless networks. If you’re connected to a wired network, click the name of the network you’re connected to. The list of settings available for your network connection is shown. Set the Find Devices and Content switch to On. Earlier version of Windows use different terminology: "change network profile to Private" or "make this PC discoverable". Make sure you're on the same network as the printer. Uninstall and reinstall the printer using latest driver from manufacturer website. Isolate the issue to specific type of connection. Does the printer work (if available) using a USB cable? Isolate the issue to specific computer/operating system. Try a variety of other computers and operating systems. Related SuperUser question - possibly helpful if this Network Profile issue re-occurs. Refer to printer manufacturer's website for a user guide or service manual. Towards the end is often a troubleshooting guide.